A Southwest Airlines flight traveling from New York to Dallas had to make an emergency landing in Philadelphia on Tuesday after an engine failed, causing a women to nearly be "sucked out" of a broken window, according to NBC Philadelphia. Shortly after Southwest Flight 1380 departed LaGuardia Airport, the plane's left engine reportedly failed, sending shrapnel flying into the fuselage and breaking a window. Upon the window shattering, the plane rapidly depressurized at an altitude of 32,500 feet. A woman was nearly sucked out of the window but was pulled back by other passengers, according to a passenger's father-in-law, who was given information by his daughter onboard the flight, per the report. Speaking at a press briefing on Tuesday afternoon, NTSB Chairman Robert Sumwalt said one passenger onboard the plane died following the incident. Seven other passengers were treated on the scene for minor injuries, according to a report by CNN. Sumwalt says investigators are currently classifying the incident as an "engine failure." The flight carrying 149 people landed in Philadelphia at 11:20am, with the plane’s pilots calling for medical assistance for injured passengers on the runway. The woman who was nearly sucked out of the plane was rushed to a nearby hospital for treatment. According to a report from CBS News, passengers were seen leaving the plane and walking onto the tarmac. 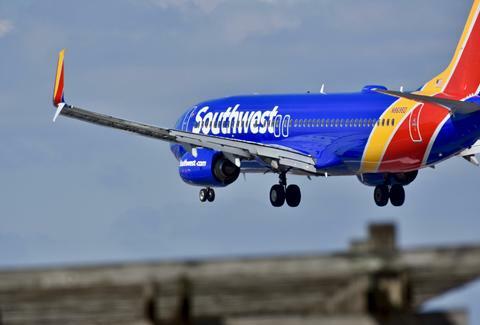 Shortly after the plane landed, Southwest Airlines started trending on Twitter, with images of the damaged aircraft flooding the website. In an attempt to convey the experience, passenger Marty Martinez live-streamed the event on Facebook. In the grainy, poor quality video, Martinez says: "Something is wrong with our plane! It appears we are going down! Emergency landing!! Southwest flight from NYC to Dallas!!" Martinez, who uploaded his videos after the plane landed, told CBS that he saw "blood everywhere" inside the plane. “She wasn’t like sucked out of the window or pulled out. But her like arms and her body were sucked, like sucked in that direction, from my vantage point. So you see people, from the back of the seat, holding onto her, you know, trying to keep her contained,” Martinez told CNN. UPDATE: Southwest issued another statement later on Tuesday afternoon, confirming one fatality on Flight 1380. It also issued a video apology (shown below) featuring Southwest CEO Gary Kelly, who called the incident "a sad day." "Southwest Airlines Co. (NYSE: LUV) confirms an accident involving Southwest Airlines Flight 1380. The flight made an emergency diversion to Philadelphia International Airport (PHL) earlier today after the Crew reported issues with the number one engine which resulted in damage to the fuselage. We are deeply saddened to confirm that there is one fatality resulting from this accident. The entire Southwest Airlines Family is devastated and extends its deepest, heartfelt sympathy to the Customers, employees, family members and loved ones affected by this tragic event. We have activated our emergency response team and are deploying every resource to support those affected by this tragedy. For a message from Gary Kelly, Southwest Chairman and Chief Executive Officer, please click here. Please join the Southwest Family in keeping all of those affected by today's tragedy in your thoughts."